What is the main source of energy for all organisms? Every food web has what two things? What is the one thing most plants use but they really don't need? In what direction does energy flow through a food chain or food web? It flows in ONE direction! What do the arrows in a food web represent? The flow of energy from one organism to another. True! A squirrel can't meet its basic needs in the ocean! What is the name for an organism that hunts down other organisms? 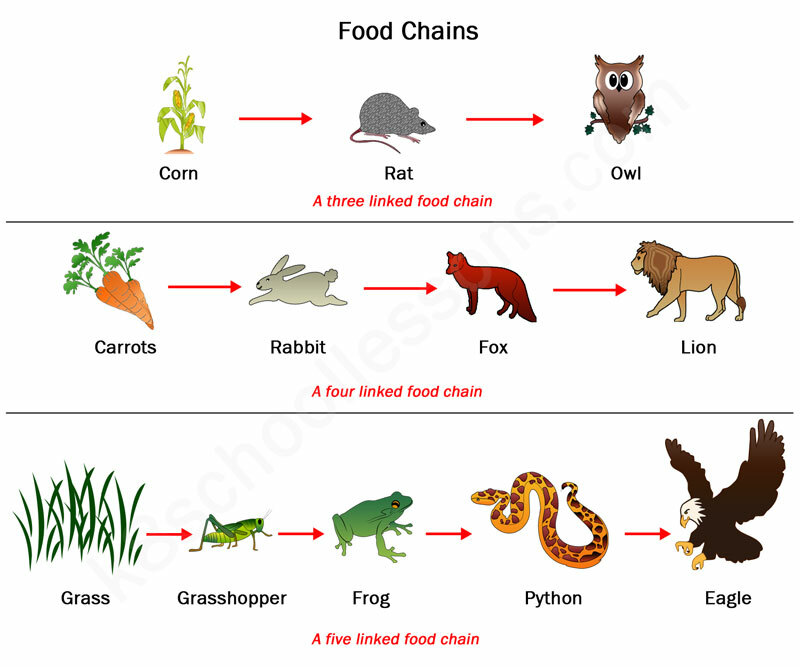 Describe the flow of energy in one of the food chains below. Use key vocabulary to describe the movement. What does interdependent mean in relation to ecosystems? It means that organisms depend on one another for survival. Nitrogen compounds are like super energy. They can only be found in soil and water. They can not be found in the air. All living and non-living things surrounding an organism. What is a consumer and give an example. A consumer is an organism that gets its energy by eating or consuming another organism. Examples will vary. What are the four basic needs of an animal? What is an energy pyramid big at the bottom and smaller at the top? Producers contain the most energy because they make their own food. Organisms that eat producers, use their food energy and release it as heat energy, therefore converting energy to something else. What is the definition for an ecosystem? All living and non-living things and their interactions in an area. What is the green substance in plants that assists with photosynthesis? What is the difference between a primary consumer and a secondary consumer? What do 5 things do plants need to survive? What is the difference between hydroponics and aquaponics?